Six birders were welcomed at 7:00 AM on Saturday, Novemberl14, 2009 with a gorgeous red sunrise complete with some clouds, Venus and a narrow sliver of the moon. Leaves showed the range of colors–light green, dark green, yellow, orange, red, brown and all the shades between. I do not recall ever seeing the mesquite leaves turn such a rich yellow color. Sumacs were their well known bright red. Temperatures were pleasant, winds calm. Had there been no birds, it would have been a great day to be outdoors. bird list for several other “really good” birds that we saw. All agreed that it was a great, fun day to be outside and bird! Birds are on the move. Be on the look-out! 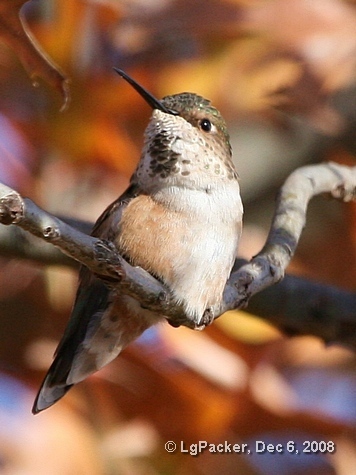 It’s the time of year birders await with eager anticipation. 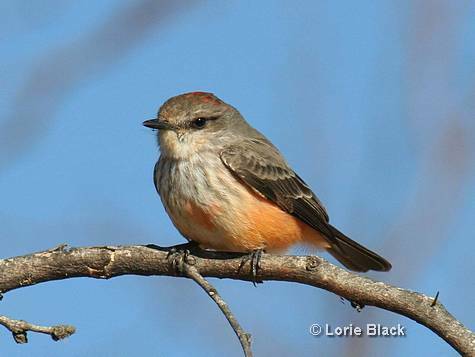 How will spring migration be this year? 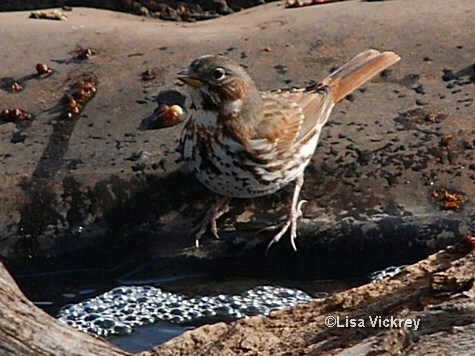 The songbird migration of 2009 kicked off in early April with very good numbers of Clay-colored Sparrows moving through along with Chipping Sparrows. Indigo, Lazuli and Painted Buntings have all been seen at Cedar Gap Farm. Now will the warblers make a good showing? 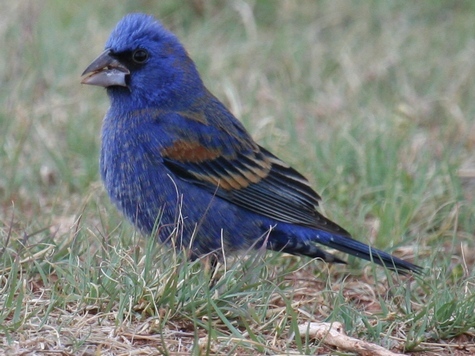 If not, we still have a number of beauties, such as Blue Grosbeak, to enjoy. So get out there and see what’s moving through! Some are just passing by, so some are staying to enjoy for the rest of the spring and summer. 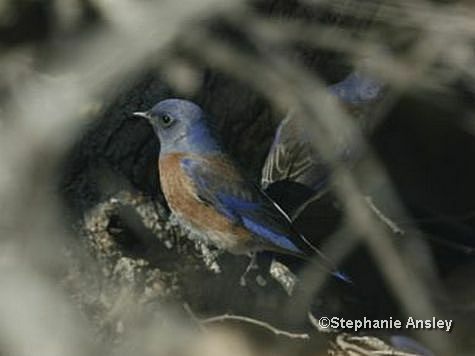 March Birding Madness: County Firsts! 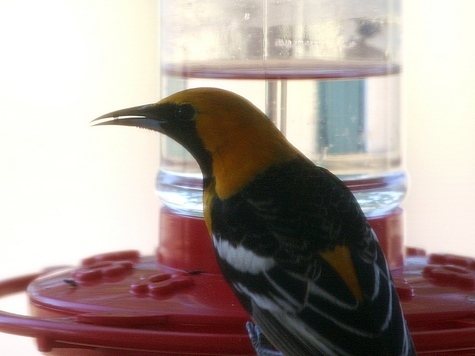 Hooded Orioles are normally found along the Rio Grande, in southern Arizona, in California and in Mexico. Anhingas are aquatic birds normally found east of us along the Gulf Coast, along freshwater streams and ponds. They spend considerable time in the water, body submerged with only the neck, face, and bill visible. When not swimming the bird sunbathes on branches overhanging water as seen in the above photo. 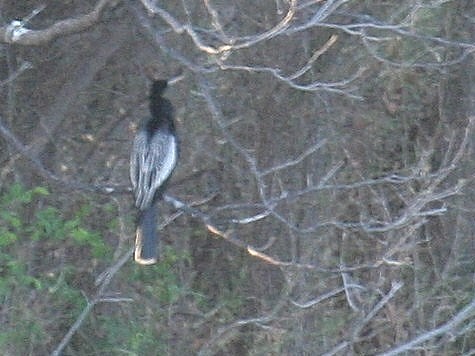 The oriole, on the other hand, is associated with much drier habitat. Why a waterlogged species and a desert dweller were seen days apart is anyone’s guess. Perhaps their breeding hormones or the crazy weather patterns of late caused them to fly a little further than they had anticipated. 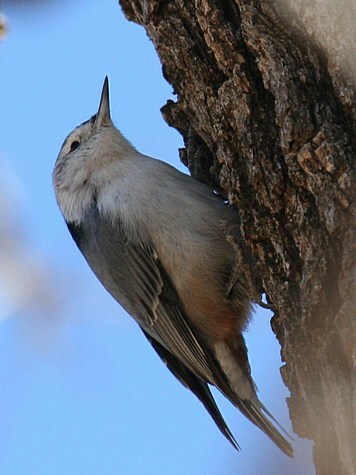 While not rare for our area, White-breasted Nuthatches are very uncommon in the Big Country. They are more of an Eastern species. But this one was found and photographed by Lorie at Oakwood Trails the first of March. Another bird hard to see (because it is nocturnal) is this Common Poorwill. Thought to be roadkill, Heidi pulled over and picked it off the road only to find out it was alive! 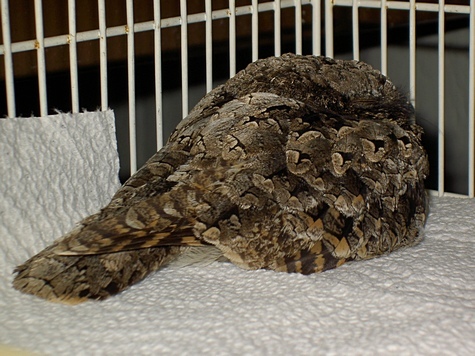 A quick trip to the Abilene Zoo’s Rehabilitation center brought it back to full health and it was released the next day. Can’t find its eye or beak? Here’s a closeup to help you figure it out. To see more oriole, poorwill, and other bird photos from our members, go to our March Birding Madness Gallery. Dan has wonderful pictures of a Fox Sparrow, Lorie has more pictures, John recorded a field trip to Cedar Gap Farm, and Laura has one or two also. Speaking of Laura, the only poster to this site until now, BCAS is now happy to announce she has two new backups, Dan and Lorie. 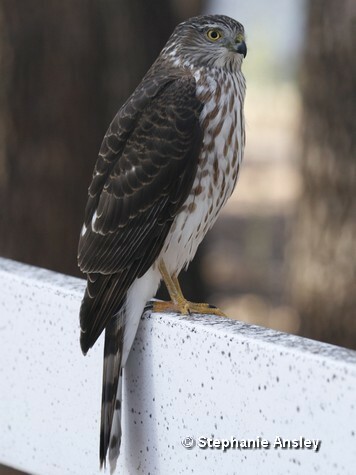 They will be adding their birding knowledge and expertise to this site. Blogging goodness slowed the first of this year when Laura had to take time off to battle cancer. She appears to be winning the battle and thanks everyone for their many thoughts and prayers. 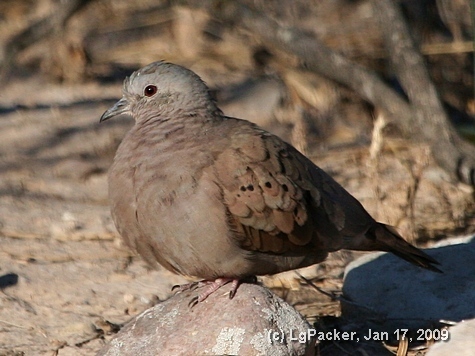 Kudos to Don (who’s identity will remain protected); he found the bird in his backyard hanging out with the Inca Doves. Also, over at Ocellated, there are some excellent first photos of this rare sighting. 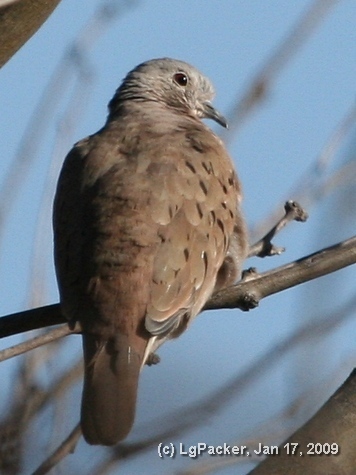 This dove is from Mexico. 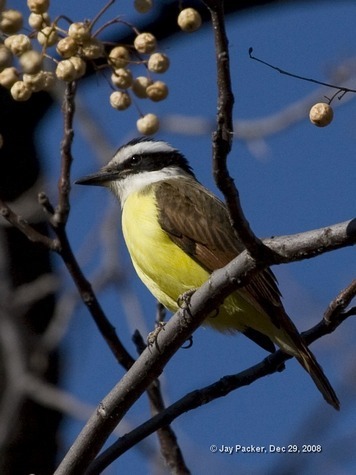 If you look in a field guide, you might find a drawing of the bird, but you won’t find its range map because only a few confirmed records have been found in extreme southern Texas, near the Rio Grande River. And yes, technically the dove is not in the Big Country. But it’s just one county away! Near enough to chase! And that’s what I did this past weekend. Heidi’s still my friend, I have a new lifer, and all is right with the world. What more could I ask? 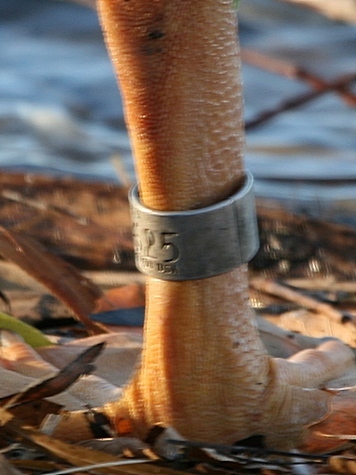 If you find a tagged or banded bird, please report it to http://www.pwrc.usgs.gov/bbl/. This is the web site of the North American Bird Banding Program. There are instructions there on how to report your sighting (or call 1-800-327-BAND). I reported the sighting at their web site and last week I received a letter stating the bird was banded at the Blackfoot Reservoir, 4 miles southwest of Henry, Caribou County, Idaho! 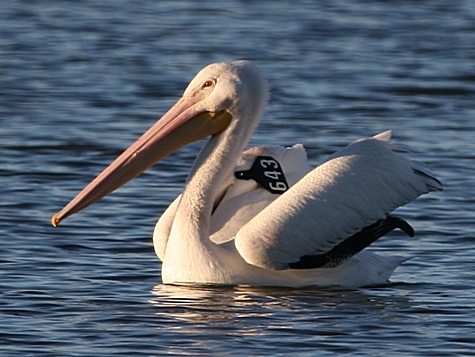 The pelican was banded in 2008 when it was too young to fly. So it’s not even a year old. I always wondered where our northern visitors were coming from and now I know one came from the Blackfoot Reservoir! I think it’s enjoying hanging out with the Resident-Rehabbed (years-ago) pelican which has not migrated since its release back to the “wild.” Hmmm…will the resident pelican take off in the spring with its new-found friend or will it create another slacker like itself? The drama continues! 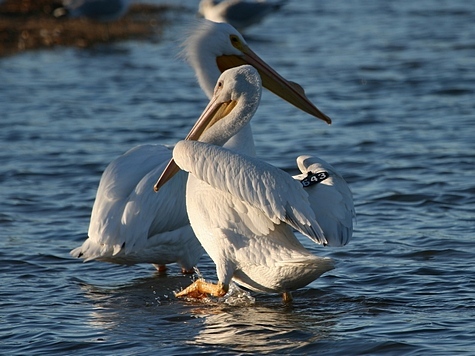 Baby Blackfoot (foreground) frolics with Resident-Rehabbed Pelican at Nelson Park, mid-December, 2008. Nothing happens in the bird world in December, right? Besides we’re too busy with holidays, CBCs (I did three! ), shopping, baking, and entertaining. But while we were sleeping and waking and running, some of you noticed the birds and sent us photos. It set the latest “last-seen-in-the-fall” record for the Big Country. This makes the “third-consecutive-year” record we’ve found this large Valley resident in the Big Country. 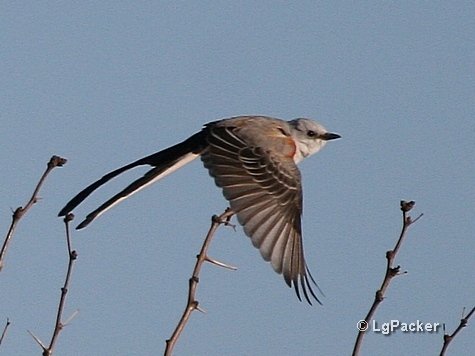 Either this is the latest record or earliest record we have for Vermilion Flycatcher. I don’t know…I’m confused. But wait! We have other birds that stepped in front of our cameras and in front of our cars (It’s not gory; Heidi found an excellent specimen.) I’ve put their pictures up at the December 2008 Gallery. I even caught that jolly-bearded, red-suited guy stopping by to grab a treat! Thanks to those that sent in photos this past month!